It’s well known that Canada’s public, universal medicare coverage of physician and hospital services is a very cost-effective way of delivering care to Canadians. Repeated studies demonstrate that Canada’s medicare system delivers comparable service to private systems with lower per capita costs. More importantly, we do so while covering every Canadian. Evidence has been mounting for decades that we can achieve the same result with pharmaceutical coverage. Most recently, using very conservative assumptions, the Parliamentary Budget Office found that we could have covered every Canadian’s pharmaceutical needs and saved $4.2-billion in 2016 if universal, single-payer pharmacare had been in place. The study also found that we will continue to save over $4-billion per year into the future. These savings are not isolated, and indeed are likely under-stated. 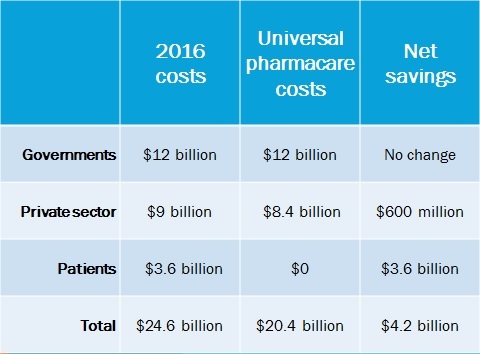 Empirically driven, peer-reviewed studies have repeatedly demonstrated that universal, single-payer pharmacare will result in national savings in the range of $7-billion to $13-billion annually. How is such a clear win-win policy possible? Using the PBO methodology as an example, the math is straightforward.The savings are achieved principally though the increased bulk purchasing power of a pan-Canadian universal program. However, additional savings are reaped through reduced cost-related non-adherence, streamlined administration, disciplined formulary control, better prescribing practices, and judicious use of exclusive licencing agreements. Of the $24.6-billion spent on pharmaceuticals by all sources in 2016, $12-billion was incurred by governments, $9-billion by private insurance plans, and $3.6-billion directly by patients themselves. Had we employed a single-payer universal pharmacare system that year, he calculated that we would have needed to spend only $20.4-billion (and hence, saved $4.2-billion). So, where would the $20.4-billion needed to fund universal pharmacare come from? Since the federal and provincial governments already spend $12-billion on pharmaceuticals, they would have to raise a further $8.4-billion. Given that $9-billion in private-sector spending would be eliminated by universal pharmacare, the federal government could raise the entire additional public share of pharmacare through a targeted levy re-directing funds to the federal government. So: patients save $3.6-billion; the private sector saves $600-million; provincial and territorial governments don’t have to spend a nickel in extra costs; and the federal government can raise the $8.4-billion it needs simply by re-directing private sector expenditures from private plans to the federal government.ting their out-of-pocket costs. While there are clear financial costs imposed by deferral, it’s vital to remember that the human cost of inaction is far higher. Every day we delay implementation, more Canadians fall sick, and some will die, from curable illnesses left untreated. The study found that every year we delay implementing universal pharmacare, we can expect 640 premature deaths of Canadians with ischemic heart disease; 420 premature deaths of working-age Canadians with diabetes; and 670 premature deaths from all causes among older working-age (55-64) Canadians. 70,000 older Canadians (55+) will suffer avoidable deterioration in their health status, and 12,000 Canadians with cardiovascular disease aged 40+ will require overnight hospitalization.Indeed, a recent study by the Canadian Federation of Nurses Unions revealed, for the first time, the estimated annual number of deaths and illnesses in Canada that result from financial barriers to accessing prescription medications. And these numbers understate the problem, as they only deal with deaths and illnesses from heart disease and diabetes. Canadians can’t afford to wait. They need action from their federal government.